What does multiple sclerosis (MS) look like (pictures)? Can children and teenagers develop multiple sclerosis (pediatric MS)? What are the early symptoms and signs of multiple sclerosis? How common is multiple sclerosis? Who develops the disease? Is MS hereditary? 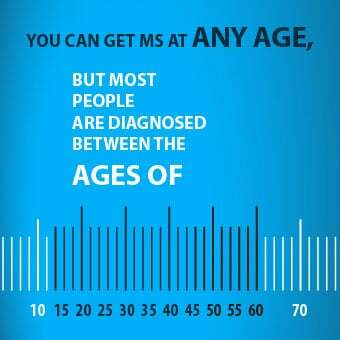 What is the life expectancy of a person with MS? What exams and tests diagnose MS? What are the treatment guidelines and options for multiple sclerosis? What are the treatments for MS symptoms? What is the life expectancy for a person with multiple sclerosis? Is it fatal? Which types of doctors and specialists treat multiple sclerosis? What research is being done on multiple sclerosis? Although the exact case is unknown, it's considered an autoimmune disease. Rarely, MS in children and teens (pediatric MS) get MS. Symptoms, causes, and treatments for MS in children and teens are similar to those for adults, except children and teens may also have seizures and/or mental status changes. There is no one test to diagnose MS. Doctors and other health care professionals diagnose the disease by a patient's history, physical exam, and tests such as MRI, lumbar puncture, and evoked potential testing (speed of nerve impulses); other tests may be done to rule out other diseases that may cause similar symptoms. Many others, depending on the patient's symptoms. Most people with MS have a normal life expectancy. Those that don't get treatment may develop mobility dysfunction while those with the severe progressive forms may develop complications like pneumonia. 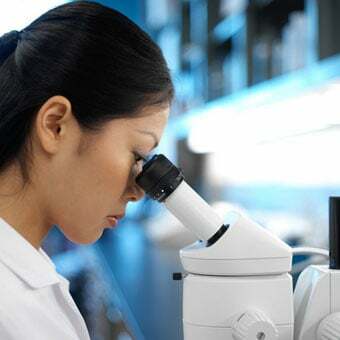 Currently, there's nothing you can do to prevent getting MS.
Research is ongoing into developing new medications, immune system modifications, and other ways to identify potential causes of MS. 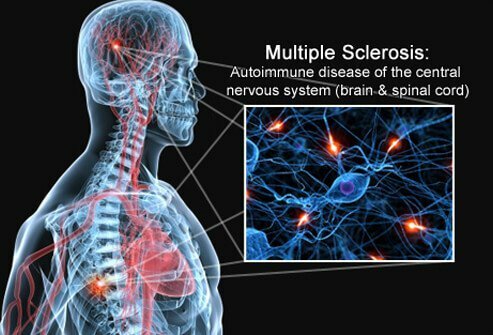 Multiple sclerosis is a disease that involves an immune-mediated process that results in an abnormal response in the body's immune system that damages central nervous system (CNS) tissues in which the immune system attacks myelin, the substance that surrounds and insulate nerves fibers causing demyelination that leads to nerve damage. Because the exact antigen or target of the immune – mediated attack is not known, many experts prefer to label multiple sclerosis as "immune-mediated instead of an "autoimmune disease." Multiple sclerosis is a disease that causes demyelination of the brain and spinal cord nerve cells. When this occurs, axons (the parts of the nerve cells that conduct impulses to other cells), don't work as well. Myelin acts like insulation on electrical wires. As more areas or nerves are affected by this loss of myelin, patients develop symptoms because the ability of axons to conduct impulses is diminished or lost. The specific symptom that someone experiences is related to the area that has been affected. As demyelination takes place, areas of inflammation and subsequent injury can be identified; these areas of injury are called lesions or plaques and are readily apparent on magnetic resonance imaging (MRI) studies. While multiple sclerosis is considered an autoimmune disorder, the exact cause hasn't yet been found. There are many theories regarding the reason that people develop MS. These theories range from vitamin D deficiency to a viral infection. Even consuming too much salt is being looked at as possible causes. However, none of these theories has been proven, and the cause of MS remains unknown. It's not contagious, and can't be passed from person to person. Children and teenagers can have MS (pediatric MS). It is estimated that about 8,000 to 10,000 children and teens up to 18 years old have been diagnosed with pediatric MS. Moreover, an additional 10,000 to 15,000 children and teens have had at least one symptom of the disease. Almost all children diagnosed with pediatric MS have the relapsing-remitting MS type; however, additional symptoms often not experienced in adults with MS may include seizures and mental status changes like lethargy. Children and teens with multiple sclerosis are treated with the same therapies as adults, but they are considered “off label” for treating children, (not an FDA approved use for the drug, but it is/may be effective for some people with the condition). Small studies suggest the IV drug natalizumab (Tysabri) is safe to use in children with MS who have not responded to other treatments. Discuss all of your child’s MS treatments or home therapies with his or her health-care team. 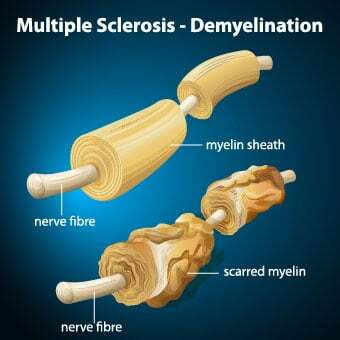 Multiple sclerosis symptoms are dependent on the area of the destruction of the myelin sheath protecting the nerves (demyelination). Early signs and symptoms are vision problems like double vision or vision loss. In some cases, a person may develop incontinence or even an inability to empty their bladder. As the condition progresses, some people are left with muscle spasticity, or an involuntary painful contraction of certain muscles. Multiple sclerosis occurs predominantly in younger persons, with those aged 15 to 60 most likely to be diagnosed. The average age of diagnosis is about 30 years; however, multiple sclerosis has been identified at all ages. While multiple sclerosis can occur in children, this is very rare. About 2.5 million people worldwide have been diagnosed with MS; of those, about 400,000 live in the United States. Women are about twice as likely as men to develop multiple sclerosis. Genetic factors don't seem to play a large role in the disease. Although people who have a first-degree relative with MS have a slightly higher risk of developing it themselves, this risk is felt to be modest. People who live in northern latitudes (especially Northern European countries) were previously identified as having a higher incidence of the MS. However, over the last 30 years, more cases of MS are now being diagnosed in more temperate regions such as Latin America. Moreover, living in an area until approximately age 15 seems to give someone the relative risk of developing MS for that area. People younger than 15 who move assume the risk of the new location. Lifestyle factors are not risk factors for developing MS, for example, diet, exercise, tobacco use, unlike conditions in which these risk factors are very important, such as stroke, heart disease, or diabetes. 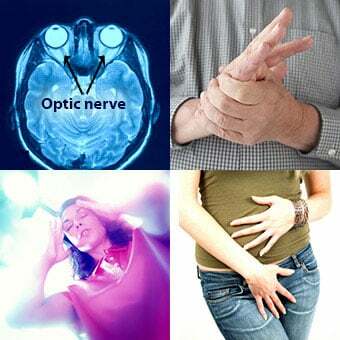 There are four types of multiple sclerosis. Relapsing-remitting multiple sclerosis (RRMS) is the most common form of MS.
People with this form of the disease develop symptoms that respond to treatment and then resolve. The development of symptoms is often referred to as an exacerbation of the disease. Episodes of remission may last for weeks to years. Secondary-progressive multiple sclerosis (SPMS) is diagnosed when the problems caused by an exacerbation don't fully resolve during a remission. This often occurs in patients who were initially diagnosed with RRMS. Over time, patients are identified with progressive debility. Primary-progressive multiple sclerosis (PPMS) progresses over time, without episodes of remission or improvement of symptoms. 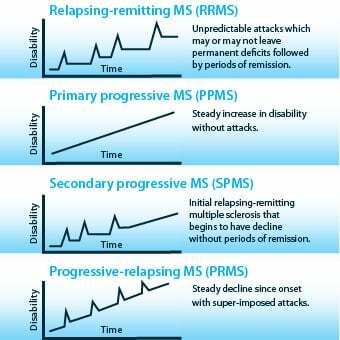 Progressive-relapsing multiple sclerosis (PRMS) is identified when patients experience escalating symptoms over time, as well as intermittent episodes of remission. Patient history important because many people with multiple sclerosis have experienced various symptoms, which were ignored or attributed to other events or illnesses. If a person recalls no prior symptoms, the remaining medical history is needed to exclude other conditions that might mimic multiple sclerosis. Once the history is obtained, a complete physical examination is required. 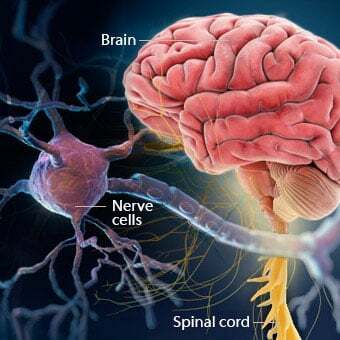 Doctors look for signs of injury to the central nervous system (either the brain or spinal cord); findings on the examination can help a doctor determine which area of the central nervous system (CNS) is involved. Imaging studies help to confirm a diagnosis of multiple sclerosis. The most common test done is a magnetic resonance image, or MRI. CT scans, while helpful in finding some brain injuries, are unable to reveal the changes associated with multiple sclerosis with as much detail as an MRI. MRIs can be used to image the brain and the spinal cord. A spinal tap, or lumbar puncture, is done to collect a small amount of cerebrospinal fluid. Testing can be done on this fluid to confirm the presence of protein, inflammatory markers, and other substances. With the routine use of MRI, performing a spinal tap is not considered mandatory, unless there are questionable findings on the MRI or other questions to answer. Evoked potential testing (visual evoked potentials, brainstem auditory evoked potentials, and somatosensory evoked potentials) can show slowed response times in the optic nerve, the auditory nerve, the spinal cord, or the brainstem. While helpful, these tests are not specific for changes seen in multiple sclerosis. When multiple sclerosis is suspected, blood work and testing to exclude other conditions, such as Lyme disease, vasculitis, lupus, human immunodeficiency virus (HIV), and processes which lead to multiple strokes, are often done as well. Many factors go into consideration for the treatment of a patient who has multiple sclerosis. During an acute exacerbation, steroids given through an IV are commonly prescribed, and often help patients recover more rapidly. If a patient cannot receive steroids, plasma exchange can be used. Steroids given through an IV are commonly used to treat acute exacerbation of the disease, and often help people recover more quickly. If an individual cannot receive steroids, plasma exchange can be used. Once a diagnosis has been confirmed, disease-modifying therapy is often recommended. This therapy may decrease the number of exacerbations that a patient experiences or decrease the severity of an exacerbation. In addition, many of these therapies have been shown to decrease the potential for developing long-term disability. Interferon therapies (Avonex, Betaseron, Extavia, Rebif, Plegridy) must be given by an injection. The frequency of injections ranges from every other day to every other week. Some patients develop flu-like symptoms or nodules under the skin following each injection; other patients may develop severe depression. Glatiramer acetate (Copaxone) works along a different path than the interferons, but is still thought to modify the immune system and has been shown to reduce relapses. Other oral medications have been approved to treat multiple sclerosis are fingolimod (Gilenya) and teriflunomide (Aubagio). Another oral agent, dimethyl fumarate (Tecfidera), may function by preventing immune cells from attacking cells located in the central nervous system, and may have anti-inflammatory properties. 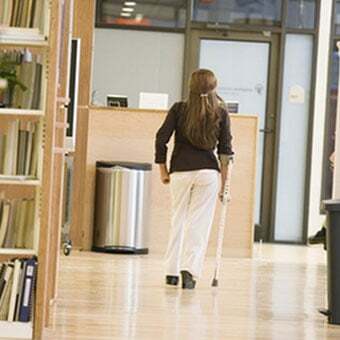 Dalfampridine (Ampyra) has been approved to help with walking problems caused by multiple sclerosis. The specific way in which this medication works is unknown. There is a risk that this medication may cause seizures, even in patients without a history of seizure or epilepsy. As such, the use of this medication needs to be monitored carefully. Natalizumab (Tysabri) is a monoclonal antibody, and has been approved for patients who have relapsing-remitting multiple sclerosis. Because of significant side effects, including the risk of severe brain infection, it is typically used for patients who have failed to respond to one of the interferon products or who have been diagnosed with very active disease. Alemtuzumab (Lemtrada) can also decrease the relapse rate in relapsing-remitting multiple sclerosis. However, because of the risk of serious side effects, it is currently limited to use in patients who have failed other agents. Mitoxantrone (Novantrone) is a chemotherapy agent for leukemia or prostate cancer, which has been shown to be of benefit in treating secondary-progressive multiple sclerosis, progressive-relapsing multiple sclerosis, and advanced relapsing-remitting multiple sclerosis. Of note, mitoxantrone and Betaseron are the only medications identified to help patients with relapsing-primary multiple sclerosis. 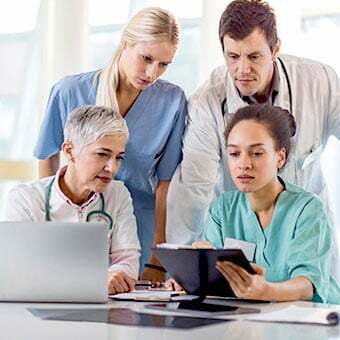 It is important for patients to have an ongoing dialogue with his or her doctor and other medical health care professionals to describe any residual difficulty or symptoms following an exacerbation so that these symptoms can be addressed and treated. Experimental therapies being explored to treat or possibly cure multiple sclerosis include stem cell transplantation. Preliminary results from one study, which followed patients for 5 years suggested a decreased relapse rate and improvement in disability. While promising, these results need to be evaluated carefully before this treatment is approved. In 2009, a vascular surgeon proposed that multiple sclerosis was caused by venous abnormalities that responsible for the true cause of multiple sclerosis was venous insufficiency. This proposed theory was termed chronic cerebrospinal venous insufficiency (CCSVI). A number of studies have tried to confirm this theory since it would markedly change the approach to treating multiple sclerosis. However, most of the recent data has not shown a causal relationship between any venous insufficiency and multiple sclerosis. Ongoing studies are being conducted, but some experts suggest the more recent findings in the ongoing findings will disprove this hypothesis. People with multiple sclerosis are believed to have the same life expectancy of those without multiple sclerosis. However, those with severe, progressive forms of MS may have problems caused by the disability may lead to complications such as pneumonia. If patients are not treated, over 30% may develop pronounced problems with mobility. It is not yet known what the long-term outcome of patients who begin treatment at an early stage of their disease will be. There are two extremes in multiple sclerosis. The first is a "benign" syndrome in which patients have numerous lesions identified on MRI imaging, but have few -- if any -- symptoms, even decades after their diagnosis. At the opposite end of the spectrum is a condition identified as the Marburg variant of multiple sclerosis, where rapidly progressive symptoms are seen and death may occur after a very short time. Without a clearly defined cause of multiple sclerosis, ways to prevent this disease have not yet been identified. Exercising regularly, getting sufficient sleep, or eating healthy meals will be of long-term benefit for many people, but have not been shown to be of help to prevent the development of multiple sclerosis. Speech pathologist: A speech pathologist can help patients improve speech clarity, and some can even work on cognitive exercises for patients who have problems with memory. If swallowing problems are identified, speech pathologists can help determine the cause and whether therapy will help improve swallowing ability or if dietary changes are needed. 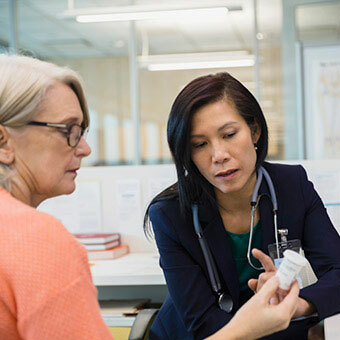 Primary care provider: A primary care provider such as a family doctor or internist is needed to help keep patients with MS in good health by keeping track of blood pressure, cholesterol, glucose, immunization status, and other factors. Radiologist: A radiologist reads the imaging studies obtained to monitor the status of patients with MS by comparing current studies to prior studies, doctors can determine if the disease has stabilized. Physical therapist: Physical therapists work to help patients regain mobility or strength. They also help patients determine how maintain their strength and mobility after a chronic disease is diagnosed. Occupational therapist: Occupational therapists often work closely with physical therapists to help with mobility issues due to MS. Moreover, these therapists also teach people with MS how to adjust or modify things in their surroundings and homes by using tools or actions to safely perform daily activities. Clinical psychologist: A clinical psychologist can help patients with MS who are experiencing depression, anxiety, or who need help in coping with their diagnosis. Psychologists provide counseling or psychotherapy; they do not prescribe medications. On occasion, they work closely with psychiatrists who determine if medications are needed, and if so, which medications to prescribe. Neurologist: A neurologist is a doctor who has specialized training in diseases of the brain and nervous system. Some neurologists have additional training in treating multiple sclerosis. Many areas related to the diagnosis and treatments of multiple sclerosis are being explored. These include more in-depth analysis of genetic factors, including factors, which may help with the diagnosis and prediction of patient response to treatment options. Drugs that show promise in eliminating or preventing new multiple sclerosis lesions from forming are being evaluated. These new MS medications include drugs in pill form and by injection. A good animal model of multiple sclerosis has not been yet developed. Researchers think that a working animal model would help with the development of medications to treat multiple sclerosis. Stem cell therapy, which may help reboot a patient's immune system so that multiple sclerosis lesions no longer form, is being evaluated more closely. Compston, A. and A. Coles. "Multiple sclerosis." Lancet 372.9648 (2008): 1502-1517. Nicholas, J. A., et al. "Multiple sclerosis: Five new things." Neurology: Clinical Practice 3.5 (2013): 404-412. Science-BastedMedicine.org. The End for CCSVI. What treatment have you had for multiple sclerosis? What's the prognosis with your multiple sclerosis? How was your multiple sclerosis diagnosed? Were you, a friend, or relative diagnosed with MS? What do you think the cause might be? The symptoms of multiple sclerosis can vary greatly from patient to patient. What were your symptoms at the onset of your disease? What type of multiple sclerosis do you have? How do you cope with the symptoms and your condition? Learn about celebrities, such as Montel Williams and Jack Osbourne, who are living with multiple sclerosis.